: Keep existing shape or more natural look? I've received great information on feeding/watering needs of this Grey Bark Chinese Elm (ulmus parvifolia) and it seems happy. Tree is approx. 15" tall which I found in a plastic pot for $59.00. 1. Does the current leaf pad style have a style name and is it common and desired for trees like this? 2. Do any of you see promise if I let it back bud and form more of a natural canopy and shape? 3. Someone suggested I cut off the left bottom branch as it apparently didn't contribute to the natural look I seek. You can see that left bottom branch in question in the new photos I took. Any of you taking a stab at this are greatly appreciated. Re: : Keep existing shape or more natural look? The tree looks healthy which is a good start. I'm afraid that in my view you'll never achieve the natural look you want with the base of the tree as it is. The roots are a mess at the current planting angle, and the movement is very contrived and artificial. However, I do see some potential options. You could air-layer off the top section to create a tree with a better base, then once the air-layer is cut off use what is left of the base to create another small tree with a better planting angle. I would layer off the top section just above the second branch to the right. This will give you potential to create the natural-looking tree you want, and you can work on the branching. Once the top section has been cut off, I would cut the bottom section horizontally across, flush with the first branch at the right. That branch will become your future leader. You may get some budding around the cut. If there are any sprouts to the left of the cut, let one or two of them extend. These will give you options for a future low first branch. Then next spring, repot that base section at a different angle: rotate it to the left, so that the leader (the current first branch on the right) is vertical, and the messy roots are buried (sort them out as much as you can). This will become your new trunk. Repot into a large growing pot. Then it's a case of growing on, cutting back, growing on etc etc for a number of years. This is what I would do with the material you have. It will be a number of years before you have a 'result' from the bottom section at least, but I think it will increase the potential to get a good tree out of this. Otherwise you may end up spending years working on something that you will ultimately be disappointed in (been there, done that). In Hawaiian slang, that tree looks "kapakahi." Kind of crooked and bent but not necessarily in an aesthetically pleasing way....yet. Be warned, that I am not a bonsai traditionalist. I am more of a product of a rich multicultural grandmom and grandpop environment back in Hawaii. What I learn about style comes from Chinese, Japanese, Hawaiian, Filipino, Korean neighborhood. So my styling advice might seem avant garde to some our esteemed bonsai minimalists. First of all, consider how long you are willing to train your tree. With bonsai stock as opposed to a finished bonsai, I keep lower base branches intact while training young trunks to help fatten the base of the trunk. Notice how the lower branches of your tree have not been weighed down like the upper branches. Maybe the intent of the person who introduced the initial bends to the trunk and weighed down the top branches had the same idea. Therefore, keep the lower branches until you are satisfied with the lower girth of the trunk. I don't aim for instant bonsai, but rather plan for a design working with materials years in advance....unless I am lucky enough to stumble across something styled and grown by extreme natural conditions. You can take some artificial shortcuts to speed base trunk girth in young tree stock but that is an entirely different topic. From an old school Chinese perspective, the tree looks like someone initially trained the trunk at an early stage in a dragon shape but lost interest in keeping the design theme fluent in the branches. The end result looks not only kapakahi but kapulu (sloppy) as well. When I see dragon shape trunks, I am more inclined to do a cascade or semi-cascade rather than an upright structure. This is more a matter of me missing the spectacular waterfall cascades on Oahu, Kauai and the Big Island of Hawaii when I am in Memphis, Tennessee where the nearest mountains are miles away. It is also the stuff of legend because the twisty dragons of Asian lore reside in mountain streams fed by waterfalls. The semi-cascade style will likely be less time and labor intensive for this tree. From a Japan perspective, the tree trunk looks like someone was aiming for Bankan style but the initial bend is a tad too grotesque in relation to the curvatures higher up in the trunk to give its shape continuity of design. Cosmetically altering this tree, as Tom mentioned earlier, will take some years and patient surgery if you wish to retain the upright Bankan form. Another design option for an upright natural look to give the tree more continuity of design while retaining a Bankan shape, is a root over rock approach. 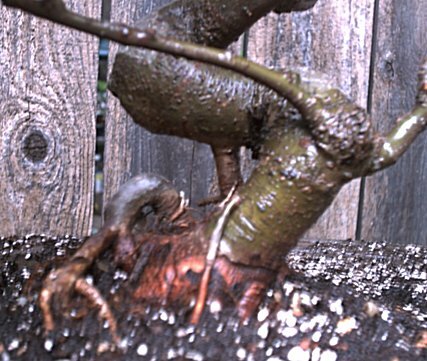 Sit the lowest bend of the trunk on a rock, do some root surgery, then use approach grafting technique to introduce some psuedo arial roots using young seedlings as root stock. This technique might be a little more advanced and work intensive. Additionally, hunting for the right shape, texture and color of rock for your tree can be as time consuming as training bonsai stock. The idea here is to aim for a design that looks like a seedling struggled to grow through the base of a rock avalanche twisting its way through loose rock till eventually time, wind and rain wore the loose rocks away. Then there is what I would call a (ahem) pseudo-Scottish-sumo style where suckers on a fat tree root develop into a line of small forest trees. The dragon shape trunk would lie partially buried in the ground and look like a Nessie shape gliding across a Scottish lake with a forest on its back. (For some reason, I think of an Uncle Marty, Martin Klein, when I think of this design.) This kind of design occurs in nature when very old trees become uprooted by severe weather, and, as the main trunk begins to die, suckers develop on top of remaining roots which are partially pulled out of the ground. The really squat sumo shapes naturally occur as a form of approach grafting by nature herself. The squatness occurs when sapplings or suckers that are growing in close proximity begin to fuse trunk cambrium and share roots. I just loosely call tree communities which share a root base "sumo" (fat and squat) and "pseudo sumo" (wide but not fat). The tradition in the last two designs is like reverse Zen: bringing Sabi to Wabi or beauty flourishes inspite of time and hardship. But I think the last design would be somewhat foreign to most bonsai enthusiasts, including Chinese/Hawaiian/Japanese/Filipina/Scottish me. Aim for what you see as beautiful, what you can relate to, and what you have the time and skill to accomplish. Pardon me for my unusual bonsai nomenclature as the last I visited the IBC forum was about 10-12 years ago when it was still a baby USENET sappling managed by Dan Cw(longnameIcantspell). I agree that losing the left branch would help. Unfortunately I agree with others that the trunk is too contrived. That wierd S curve seems to be the standard with mallsai elms these days. I'd chop it down to the bottom right branch and work from there with a slanted style. I would layer off the top section just above the second branch to the right. Keep existing shape or more natural look? Thank you all for your input as I do appreciate your time and expertise regarding Bonsai. Very nice of you indeed! I didn't expect suggestions that this could become a museum quality piece. Of course not with a $59 piece in a plastic pot. I've received expert advice from some of you on how to go about modifying the existing tree and with as much reading as I've done on this subject, actually understood the realistic and creative suggestions. I also appreciate the general history of this tree style and how purists may cringe when forced to view one. I didn't purchase it for that S shaped trunk style as much as the overall bark and leaf appearance. I actually like the little tree very much just as it is. I had to ask about further development of "natural" qualities in case it were to be had without major modification and making for a happier tree. I've decided to leave the tree as it is and continue to take great care of it. This one will still receive the same care I would of showered a thousand dollar specimen. I'll be leaving it to develop further with less pruning for now and let it fatten up a bit as well. I was drawn to it as a whole but oddly entertained by it's leaves which it seems to have many of. The leaves and trunks of these Chinese Elm are now my sorta thing when it comes to Bonsai. I love them all but that Elm is really appealing to me no matter what shape they come in. I'll be acquiring more of the ulmus parvofilia variety IN ALL SHAPES AND SIZES in the near future. Yep, I love those Elm. Not having the lineage of show quality trees will never be the tree's fault but will sure be treated here as one that does. I must say that I still love this species in all shapes and sizes. Again, thank you all for the insight as it allows me to move on with my obsession with this and similar Elms just as they are and come into my custodial possession. Chinese or Japanese Gray Bark Elm is not Ulmus parvifolia. It is Zelkova serrata. There are some subtle differences. 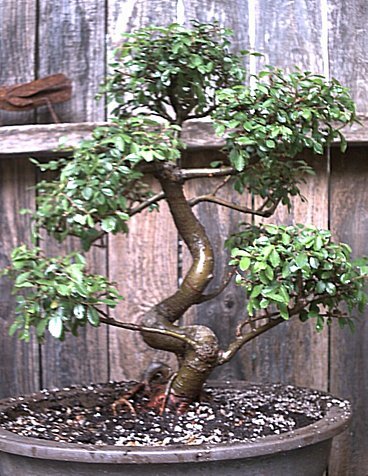 Overall bonsai techniques are similar. Removed far left branch today - looks great! I also potted the branch as with my insane luck it'll probably root. The little Elm that could.